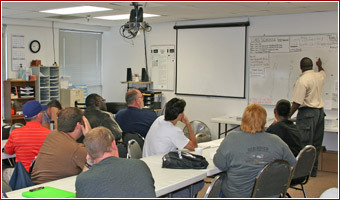 The best truck driving training programs begin in the classroom. In order to become the safest truck driver possible, students take part in classroom lectures and interactive presentations during the first week of school. This material covers instructions on proper logging procedures, trip planning and map reading, hazardous materials regulations, accident prevention and safety/mechanical issues. The classroom portion of training will ensure that students are prepared to take the wheel of a big rig during the range portion of training. Upon completing the classroom portion of the training, the student has demonstrated he or she is ready to begin working on the basic driving skills necessary to pass the CDL skills test. This important part of truck driving training takes place on a driving range strategically laid out with difference exercises conducted in small groups with professional instructors. The primary focus of our CDL instructors is to ensure truck driving students are able to safely demonstrate the maneuvers and skills necessary to pass the CDL test at the end of the training program. 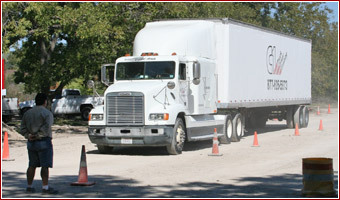 Following the driving range portion of truck driving training, it’ll be time to take to the roads of Fort Worth, Texas. With easy access from the range to low-traffic roads, students are able to get comfortable with handling the truck prior to going on the highway. Each student will be guided through different on road experiences by a professional instructor. This part of truck driver training is focused on traffic situations that are likely to come up during the actual CDL test. 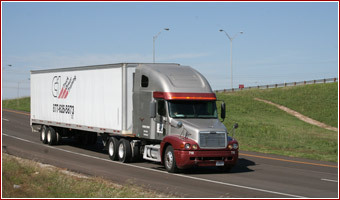 Attend Truck Driver Training in Fort Worth! CDL training classes are forming now. Get your Texas CDL in less than a month!